MOLLUSCA : NUDIBRANCHIA : Hancockiidae SNAILS, SLUGS, ETC. 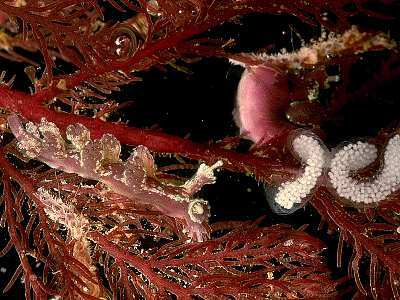 Description: The body of this rare nudibranch is pale green or pink with scattered white spots. There may be up to nine pairs of hand shaped ceratal processes. The rhinophores are unusual in that their tips are swollen and they have longitudinal lamellae. The oral veil is extended into two lateral flaps each with 3-4 finger-like projections. Adult specimens may reach 14mm in length. Habitat: Feeds on the tiny hydroid Clytia hemisphaerica (C. johnstoni) which grows over other hydroids or on algae. The spawn is similar to Doto species, a flat ribbon laid in a concertina fashion, with a distinctive blue-white colour. Distribution: Most of the records are from the Bay of Biscay, however it has also been recorded from Mediterranean France, Spain, Naples and north to St. John's Point, Co Donegal, NW Ireland. Swollen tipped rhinophores with sheaths and longitudinal lamellae. Picton, B.E. & Morrow, C.C. (2016). Hancockia uncinata (Hesse, 1872). [In] Encyclopedia of Marine Life of Britain and Ireland.